This was one of the first original pieces I made. I bought the string of the yellow orbs because I hoped the biggest one could be used to replace a knob for a pot lid. The hole was too small, so I decided to make a necklace. It seems a little too much with all the orbs, so I made the earrings to match–the first time I made earrings. 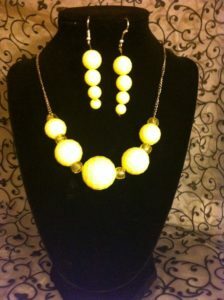 This is my only yellow jewelry. 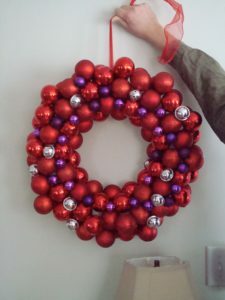 This was the first wreath I ever made. The learning curve was pretty good; I later found out how tinsel can help fill the holes, where I just kept adding more ornaments. This was a tie pin of my grandfather’s. Once you take off the pin part, it turns into a nice option for a necklace. Metal glue and a spacer bar and I made a fun necklace. 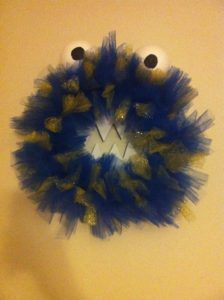 This was the first monster wreath I made. I had seen the project online (link below) and was itching to do it myself. I made this for my cousin, as a wedding shower present. Blue and gold for the colors of Notre Dame, where they met. I learned to trim the sides a little, and put the eyes closer together. Also, glitter tulle, like everything glitter, gets everywhere. I will not use tulle with glitter anymore. My grandfather died and I received a nice cufflink/jewelry box filled with cufflinks and tie pins. None of the men in my family wanted them (we are not really a cufflink kind of family) so I debated a lot about what to do with all of it. 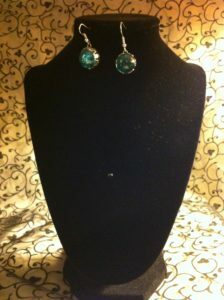 This pair was really pretty, blue glass stone with a metal back. Both sides are nice to look at so I had to decide what to do, how to do it, and which side to show. I cut the links off the back–a fairly difficult task–and managed to get jump rings onto the remainder without mangling the metal back. Add some hooks and I have a really nice, very pretty pair of earrings. 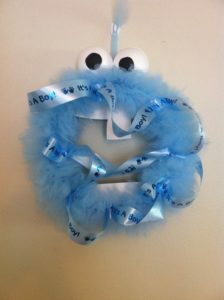 This wreath was made as a friend’s baby shower present. It could be used as a sort of announcement when the baby arrived. After that, remove the ribbon for a Halloween wreath. 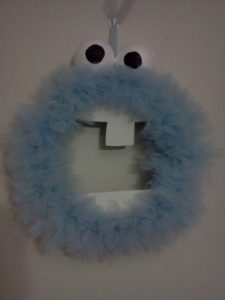 The baby (now a toddler) refers to it as “Cookie Monster”. 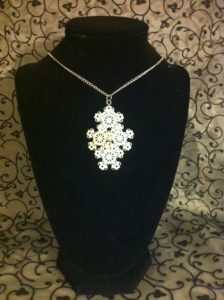 This necklace was made from one of my favorite earrings. I lost one (probably at Office Depot) but I could not bear to get rid of the other one. My aunt was entering a convent, so I made a little something for her to take with her as a reminder. 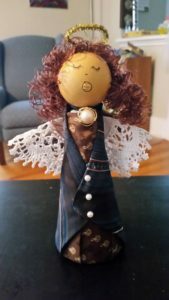 I made this angel using a necktie and a bowtie of my grandfather’s and jewelry and some bits and bobs of my grandmother’s. This was made using a foam cone. It is solid so it can stand up on it’s own. Lily Sugar ‘n Cream makes yarn cones which are hollow on the inside and make great tree-toppers. So I would love to make more tie angels, but I have no cones, and yarn is not really a medium I use, so buying the yarn for the cones would be a waste. My job involves a lot of talking on the phone. Posted earrings tend to dig into my head so I almost exclusively wear drop earrings. As such, the earring I make are on hooks. There is also a lost and find, where many single earrings end up. So I turn those earrings into necklaces. Welcome to my new website devoted to my craft projects. 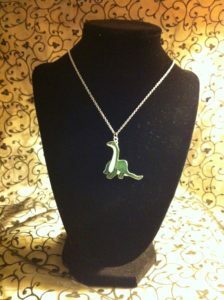 I primarily make wreaths, but have other projects as well–jewelry is a big one, but other random things too.